The Fraternal Order of Police president is demanding help after officers were put in dangerous situations while trying to corral ATVs and dirt bikes that ran amok over the weekend. 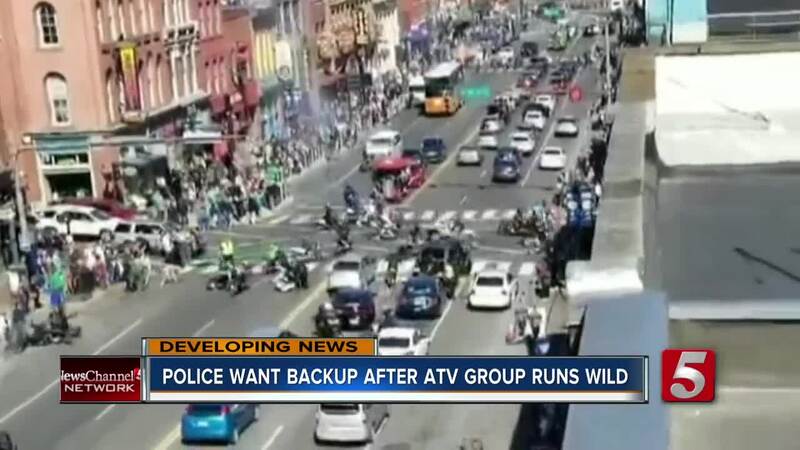 NASHVILLE, Tenn. (WTVF) — The Fraternal Order of Police president is demanding help after officers were put in dangerous situations while trying to corral ATVs and dirt bikes that ran amok over the weekend. FOP President James Smallwood said ATV groups have grown tremendously this year. On Monday, he said the police force is understaffed by 118 officers which makes corralling more than 100 off-road vehicles pretty difficult. On Saturday, Metro Police Sgt. John Borque was dragged down Broadway by an ATV when he was trying to walk across the street to investigate a hit and run. "Certainly he's hurting and sore and this absolute disregard for public safety has got to stop," Smallwood said. Around the same time, a police van was struck by a 4-wheeler. 32-year-old Quintin Whitman was arrested for reckless driving, having drugs, and driving without a license. Then on Sunday, various groups went out again parading around the streets. Our cameras were rolling as they rode by. One ATV driver ditched his vehicle and tried to run away from police in the Charles E. Davis road area. "They're creating a serious and significant public safety hazard, and they've got a complete disregard for the safety of the city and they're costing the city thousands of taxpayer dollars to try and stop this madness," Smallwood said. He said they need backup, "It can't be tolerated, we've got to find a way to bring it to an end." They're short 118 officers in the department right now which makes situations like this dangerous for the public and for officers. "And the folks that should be standing behind them in the city, the leaders of Nashville, are not standing behind them and supporting them the way they should, and our criminals see that, and these are the actions they're taking," said Smallwood. For now, police leaders are trying to come up with a plan in case this happens again. The Chief of Police met with police leadership on Monday about the weekend events. Smallwood said, "We need to turn that corner, we need to right the ship and make sure that we get the support we need so that the community sees that the leaders of this city stand behind as public servants." As of now, motive remains unclear. However, several of the riders posted pictures online with the #615BikeLife. “Bike Life” was initially a movement in other cities to encourage kids to stay out of trouble.